Yesterday, I drove to the back of Berkshire School in Sheffield to access the Elbow Trail leading up to the Appalachian Trail. I found the trailhead after asking directions but finding a place to park was confusing. Finally I saw someone who said that I could park near the trailhead but it was not a designated spot. There is visitor parking down near the athletic facility. 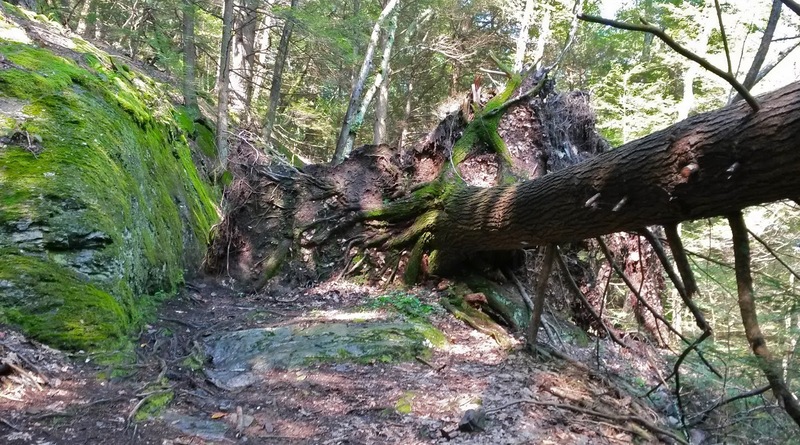 The Elbow Trail rises 1.5 miles up to the AT mostly on a woods road with some short steep sections. When I reached the AT, I turned right (north) toward Mt. Bushnell and Jug End Mountain. It was very hot and humid for September--over 90 degrees. I met only a few other hikers and we remarked to each other about the oppressive heat. Still, it was good to be outside, especially since Tuesday's hike had been rained out. The vegetation on the ridge is mostly pitch pine and scrub oak with many rock outcroppings providing views into the valley to the east. 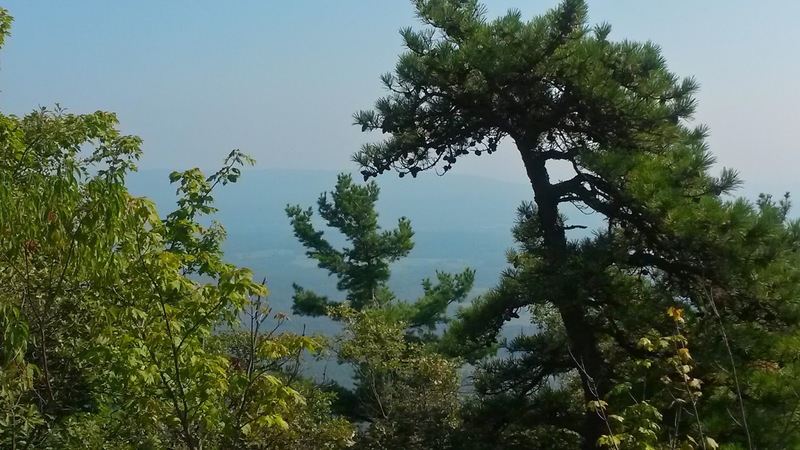 The haze was thick and interfered with the views so I enjoyed the closer scenery on the trail. I saw several kinds of lichen that I recognized, reindeer moss and rock tripe. 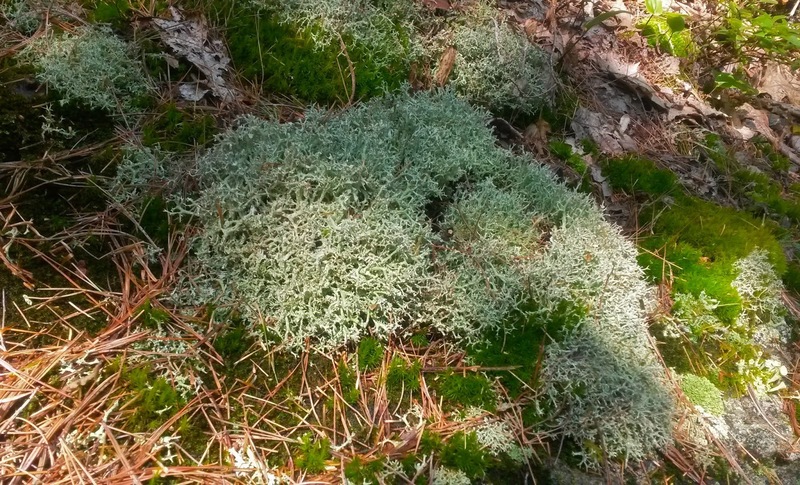 Lichen has only recently (in the 20th century) been accepted to be a partnership between fungus and algae. The fungus provides a home and protection for the algae and the algae provides nutrients for the fungus which is not capable of photosynthesis. In most cases, neither one can live without the other. How amazing! They grow extremely slowly, sometimes only a tenth of an inch a year, and can live in very harsh environments. 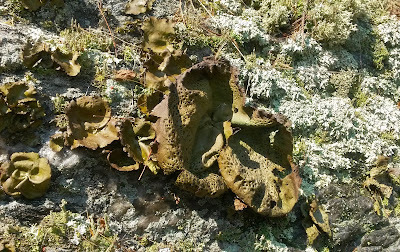 More about lichens here. 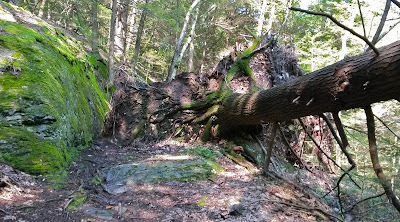 Walking up the trail, I encountered this recent blow-down of a large hemlock. that I could walk through. and is eaten by reindeer and caribou. It is brittle so do not step on it. Here's a large rock tripe with some smaller rosettes and an unidentified blue-grey lichen. The rock tripe is very brittle when dry but flexible and rubbery in wet weather. The view from my lunch spot between the pitch pines was very hazy.